I'm an obsessive matcher. If something doesn't match, anxiety ensues. That's why I tend to purchase things that I know will match what I already have or something that is easily manipulated for my matchy-matchy pet peeve. One of the many decor pieces I can match to no end are office supplies. One example is a previous post from this month of Braided Office Supplies created using mesh products and yarn. 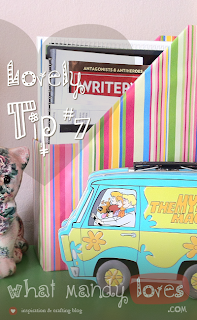 Today I'm discussing using things you already have and covering them with matchy-matchy awesomeness. 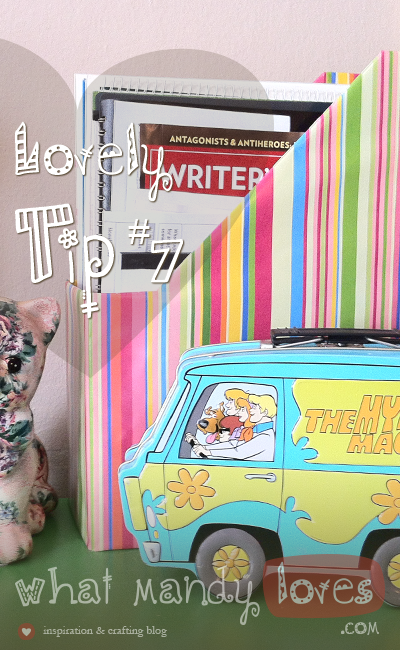 Use wallpaper, scrapbook paper, or any other expendable fancy paper to wrap flat office supplies to obtain matchy-matchy office gloriousness. A magazine holder used for work was black and white and purchased only to match an office I didn't have anymore. Now I have a green desk in my home office surrounded by the colorful wonderland that is my apartment, so the black and white had to go. Also, I have a *bonus tip* here by mentioning that I use my high school yearbooks as a monitor stand (see image below). My tallness combined with the low desk and high office chair has my neck strained with the height of the average desktop monitor, so the heaviness and thickness of these yearbooks work splendidly. 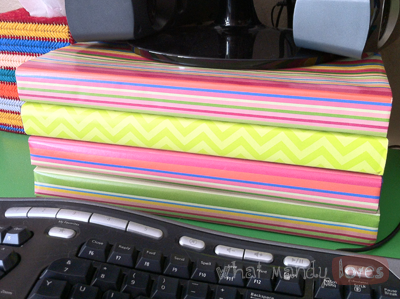 Basing the funky green desk color, I found some complimentary striped wrapping paper I could cover multiple office-related things whenever I get them (because I probably will never stop buying things) and can be used for its intended purpose of wrapping gifts. Win-win with my mulch-purpose tip, yes? During my wrapping of the books however, I ran out of wrapping paper! (Premature gift wrapping cost me complete matchy-ness CURSES!) Luckily I had paper of similar colors to go with it all so YAY it still matches and is not 100% perfect either. When it comes to your own office supplies that need a little love, match everything with 100% coverage of one paper type or color, or go nuts with multiple papers on multiple pieces. Layer on the patterns, colors, textures, etc with however you want your office style to shine! BONUS TIP: Old yearbooks make a great low-cost monitor stand.